Andrew at Eating Rules is asking his friends and readers to commit to eating only unprocessed foods for the month of October. Because I think Andrew is a terrific guy who really cares about helping people learn to eat better and because I’m trying hard to remove processed foods from my life, I signed up for the challenge. I will be writing about the experience and sharing recipes for healthier alternatives to processed convenience foods throughout the month of October. It’s not going to be easy. October is the only month of the year where it’s completely acceptable to binge on store-bought candy. And in Fresno, it’s fair season as well. I think the hardest part for me will be to go without a corn dog at The Big Fresno Fair. I might have to skip the fair altogether to avoid temptation, although that would mean missing out on a ZZ Top concert. Hmmm. Maybe I’ll go get a corn dog at the last day of The Old Town Clovis Farmer’s Market this Friday to make up for missing out on one next month. Or maybe I’ll have to break down and make my own corn dogs – Deliciously Organic featured a recipe earlier in the summer. 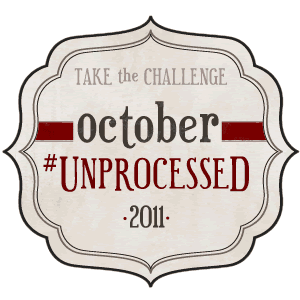 If you’d like to learn more about the October Unprocessed Challenge and perhaps sign the pledge, head over to Eating Rules to read all about it. I’m hoping that some of you will join us. I’ll be back later this evening with another sourdough update! Does sounds like a neat challenge however...Move it to Jan or Feb when I'm more inclined to want to diet. Between all the candies, goodies and fair food this month. I wouldn't even consider committing! What does that say about me? A lot, I'm terrible. im on it :) LOVE this! We are doing it too! I'll be blogging about the journey as well. Good luck! Can't wait to see what you come up with - I just shared your pear butter recipe from last year :) I plan on making a big batch for "going home for Thanksgiving gifts"
Great pledge - I'm in. All I want to know is: why in the world does your farmers' market offer corn dogs? Ick. I took the challenge last year. It was a definite learning experience. Going to do it again this October.